Threading, Tailstock, ToolPost, ElectricJibHoist, 18” 4-JawChuck. Inch/mmTreading, Tailstock, SteadyRest, ToolPost, 12”6-JawChuck. Attachment, InchThreading, Tailstock, 12” 3-JawChuck, 15” 4-JawChuck. Pexto mdl. U-1120B 16GA x 10’ Power Shear s/n H-5642 w/ Manual Back Gauging. “The Little Blacksmith” No. 50S 5” x 5” Pneumatic Corner Notcher. Ecno mdl. 130-5370 37” Kick Shear s/n 950203. Miller Syncrowave 180ST CC-AC/DC Square Wave Power Source s/n LF035751. Westinghouse Type RS CV-DC Arc Welding Power Source w/ Wire Feeder. Lincoln Idealarc 250 Arc Welding Power Source. Bridgeport Series II Vertical Mill s/n 3920 w/ Acu-Rite III DRO, Universal Kwik-Switch Spindle, Chrome Box Ways, Power Feed, 11” x 58” Table. Bridgeport Series 1 – 2Hp Vertical Mill s/n 217720 w/ Mitutoyo KA Counter DRO, 60-4200 Dial RPM, Universal Kwik-Switch Spindle, Chrome Ways, Power Feed, 3” Riser, 9” x 48” Table. Mighty Comet mdl. 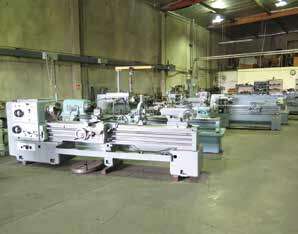 3KVHD Vertical Mill s/n 930113 w/ Sony DRO, 60-4200 Dial RPM, Box Ways, 10” x 50” Table. Super MAX mdl. YC-1 ½ VA Vertical Mill s/n 960164 w/ 2Hp Motor, 80-5440 RPM, 16-Speeds, 9” x 49” Table. Bridgeport Vertical Mill s/n 166985 w/ Enco DRO, 1.5Hp Motor, 60-4200 Dial RPM, Chrome Ways, Power Feed, 7” Riser, 9” x 42” Table. Yun Fu “Round Tower” Vertical Mill s/n 7803034 w/ 80-2720 RPM, 9” x 42” Table. 1991 Kitamura MyCenter-1 CNC Vertical Machining Center s/n 02380 w/ Fanuc Series 0M Controls, 20-Station ATC, BT-35 Taper Spindle, 150-13,000 RPM, Travels X=20”, Y=14”, Z-16”, 14” x 31” Table, Coolant. Bridgeport Series II CNC Vertical Mill s/n CNC539 w/ Bridgeport CNC Controls, Universal Kwik-Switch Spindle, 60-4200 Controlled RPM, 15” x 38” Table. Light Machines proLIGHT mdl. VMC5000 CNC Vertical Machining Center w/ Vickers Acramatic 2100 CNC Controls, SpecterCAM CAD/CAM Software System, 200-5000 RPM, 6 ¼” x 19 ½” Table. Light Machines mdl. proLIGHT CNC Turning Center s/n 016-17DG-0241 w/ Spectra-CAM for Windows Software, 3600 RPM, (2) Tool Posts, 5C Collet Closer, 4” 3-Jaw Chuck. Machine Vises 4” to 17”. 2-3-4 and 6-Jaw Chucks from 3” to 24” Diameter. Face Plates to 36” Dia. True-Trace TR-03 Hydraulic Tracer Unit. 24” and 12” Compound Rotary Tables. (2)24”, 20”, 16” and 15” Rotary Tables. NTMB 50 and 40 Taper Arbors and Tooling. OGP Optical Gaging Products “Avant 400 CFOV” Video Gaging System s/n AV4001248 w/ AccuCentric Auto Calibrating Zoom Lens, 18” x 18” Table Cap, 40” x 48” Granite Table, Computer, Joystick Controller. Mitutoyo mdl. PJ-250 9” Optical Comparator s/n 2729 w/ Surface and Profile Illumination.Hauser Type 215 Profile Projector s/n 213 w/ Surface and Profile Illumination. Covel Style 14 14” Optical Comparator s/n 14-1228. Kodak mdl. 3 14” Optical Comparator. (2)Scherr Tumico Floor Model 14” Optical Comparators. Nikon mdl. 6C Shadowgraph 11”Ooptical Comparator s/n 5582. Wilson mdl. 3JR Rockwell Hardness Tester s/n 3JR-661. (2)Phase II Rockwell Hardness Testers. Brown & Sharp 24” Digital Height Gage. Mitutoyo 12” Dial and 24” Vernier Height Gages.